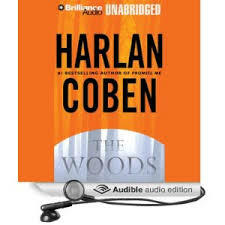 I’ll admit it; I volunteered to run all errands and transport the kiddos everywhere so that I could finish Harlan Coben’s audiobook The Woods, read by Scott Brick. Selected for me by a phenomenal librarian (shout out to all librarians everywhere) at Maryville Community Library, I had a feeling it was going to be good, and it was. Not certain of the genre or even the storyline, I popped it into my mom-van CD player and entered county prosecutor Paul Copeland’s world. On his journey to uncover the truth, Copeland revisits his adolescent youth while uncovering his own familial history. Think KGB meets summer camp. Read by Scott Brick, winner of over thirty Earphone Awards, I was able to keep Russian characters separate from Latino characters separate from . . .. In other words, I was never lost in the complexity of the characters with only one actor speaking all the parts. Bravo! I am looking forward to a return trip to the berry so that I can be surprised again by a librarian extraordinaire’s selection of an audiobook. You can’t beat a free listen!